An Asset Editor for 1. Recording a series of steps, testing the steps, and exporting them into code that can be used by the TestQuest API 2. Creating sophisticated search criteria to find images and text in the device interface. The search criteria can be saved and used with the TestQuest API commands or in a recording to test device functions. A Recordings Browser for finding, viewing, and reusing existing recordings. A Store Browser for finding and reusing saved searches and viewing their search criteria. A Packaging tool for packaging debugs and release builds to be executed on another machine. 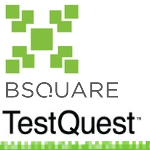 TestQuest API commands designed specifically for testing mobile devices within the Visual Studio framework. Sample tests that provide the basic structure of typical test scenarios. You can configure the samples for your device and then use them as provided, or edit them if needed.